The 1110's dramatically improved two-in-one design houses a breakdown set and a tone locator. This weather resistant instrument is able to quickly pinpoint most cable faults while reducing cable damage caused by excessive breakdown current. The 1110, which consists of a transmitter and receiver, provides three main test functions: TEST, BREAKDOWN, and TONE. 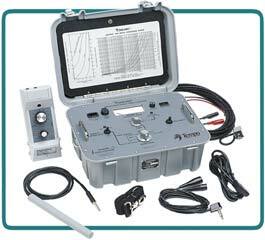 The TEST function consists of a volt-ohmmeter that allows quick fault identification. A Current Gauge Control regulates the amount of current the BREAKDOWN function uses to reduce fault resistance. The Gauge Control ensures proper welding in cable gauges of various sizes. The high output TONE function provides increased receiver sensitivity and improved AC interference rejection. DC Voltmeter. Ohmmeter. Locates buried and aerial faults. Current Gauge Control (19, 22, 24, 26, 28). High output, automatic identification tone. Metered tone loading indication. Cable path tracer. Rechargeable batteries. Battery level indicator.